Thames Discovery Programme - It's the Brandrams Again! Some of you may not be familiar with the Brandrams, but when we work on the Rotherhithe foreshore, we are always close to their big warehouse. A few years ago I followed the history of the family, and found that they originated as “artists’ colourmen” or paint manufacturers in the 18th century, and had a very large chemical factory in Rotherhithe for two centuries, making sulphuric acid, saltpetre and white lead. They crop up in the Old Bailey records in the 19th century, when various employees and others try to steal from them. And finally I spoke to one of the last of the Brandrams, who told me about the firm’s closure in 1958. 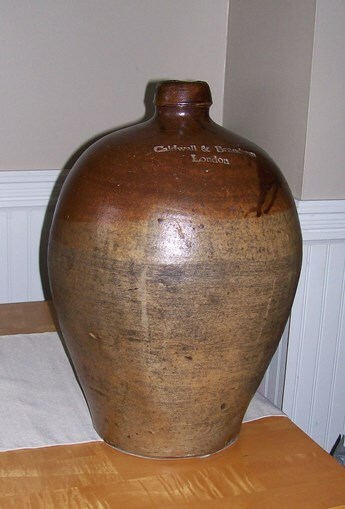 I thought that was about all, but I have just had an email from a woman in Canada, who has a large stoneware bottle or jug, about 60cm tall, stamped with the words “Caldwall & Brandram London”. She inherited it from her grandfather but is not related to the Brandrams or the Caldwalls. It is a handsome salt glazed bottle, which once had a small handle, and we believe it would have been used for importing paint to Canada. 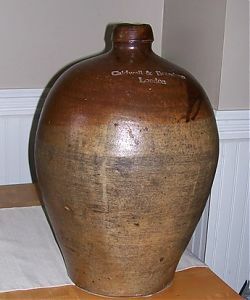 She then sent me a link to an American website, with an illustration of a very similar brown stoneware bottle, this time stamped with the words “Brandram, Templeman & Jaques”. The dates of this firm are known, 1782 – 1803. I think the Caldwall partnership was probably just before that (for complicated reasons that I won’t go into.) The Colonial Williamsburg website tells us that the bottle was made at the pottery in Fulham, one of the kilns of which is still preserved – you can see it from the District line – and also says excavations in Fulham turned up other sherds with the same stamp. I had never given any thought to what sort of containers were used to transport paint overseas in the 18th century, and of course they are much more likely to be found in Canada or America than here. But it’s a great thought that old paint tins (OK, bottles) from Rotherhithe are heirlooms and museum pieces across the Atlantic.